Did We Ever Fully Recover from the 2001 Recession? With all the talk about the souring economy, job losses, bank failures, and the like, the recession of 2009 is on the minds of everyone. But I'd like to posit that we never fully recovered from the recession that officially spanned 2001-2002. And that, my friends, puts us into a possible discussion of Great Depression proportions! Now, before you run off and withdraw all your money from the bank and bury it in your back yard, hear me out! Typically, after a recession, jobs, sales, and revenues (as well as profits) rise, most often quite rapidly. Here's a picture to illustrate what I'm trying to describe. The red arrows represent the year of the respective recession. 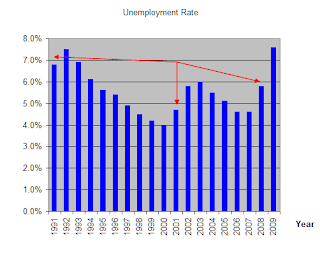 See how unemployment rises after a recession, then drops until the next one, from 1991 to 2001? And see how the unemployment rate dropped below the rate during the year of the previous recession? That is the typical behavior of the labor market. But look at what happened from 2001 on. Now, I'm not saying we're in another depression. But we're approaching Great Depression longevity, if not to the same depths. 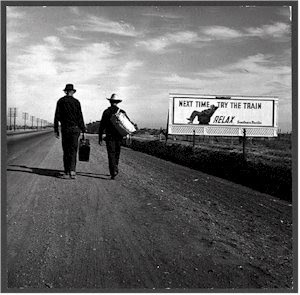 The Great Depression started in 1929, the economy made a few attempts at reviving itself, and then WWII came along. America wasn't fully involved in war preparations until 1941. So we're talking 12 years, at the most. For this last round of economic downturns, the duration has been 9 years. We're getting there. Of course, we've yet to see 25 percent unemployment. But also remember that we fudge the numbers nowadays, and there's a different sort of mindset for what constitutes "employment." In the 30s, if you didn't have a full-time job, you were unemployed. Now, if you're no longer looking for work, you're not even counted. Perhaps you've been out of a job for 3 years, got fed up, and started selling all your worldly possessions on eBay. You're no longer "unemployed." This set of circumstances didn't exist in the '30s. So, I'd say that whatever level of unemployment you see today, raise it by 30 to 50 percent. Yeah, I think it's that bad. But even at an official 8 percent, we're no higher than 12 percent. Not that that's a good thing. But it's not 25 percent, either. However, for some pockets of America, where there's 12 or 13 percent unemployment (take San Joaquin County, California, for example, where home foreclosures are at all-time highs), that figure could easily be over 18 percent. I submit to you that those folks feel like they're living in a depression! If you don't believe me, ask them!!! One last thing: If we hadn't spent $1 trillion on a war (or something else, for that matter), the economic picture during the 2000s would be even bleaker. I said all that to say this: We got out of the last depression and we'll get out of this one (whether you believe it's a recession or depression). But our way of life may have to change and that in itself may be the most uncomfortable part of it all. Jobs you would have never considered before...you may now consider. Wages you hadn't thought about since high school...you may now reconsider. Hours you thought were only for hookers and security guards...they may be under consideration! Things "I cannot live without" - you may have to live without them (like computers, cell phones, video games, cable, the list is endless). All of this will break up some families and ruin lives of countless people. But the silver lining is that dire situations may bring us closer, may give us thought for conserving what he have, and give us a greater appreciation for all those things "I cannot live without" once we get some of them back. It's a bitter pill to swallow. But swallow it we must. One last thought: There may never be a better time to go out on your own. Consider starting your own business. The Internet being what it is, with low overhead costs, fast deployment capabilities, and only your own mental limitations ("I can't do it," "I don't have time," "I am not that smart" among thousand of other excuses), the sky literally is the limit to your income potential. It may not come fast, but it will come. And in the end, you'll have more time, more money, and less stress. Get some ideas here. No pressure, no strings. There is a basic accounting tool, a web site builder with web site (free for a year), and 6 months of free payroll, too. It's totally counter-intuitive, but many VERY successful businesses (and people) rose out of the ashes of a crummy economy. You could be one of them. PLUS, if you share your small business story with Intuit (see the above-mentioned site), you could win $25,000! Here's a stimulus package that could affect you directly rather than waiting on a public-works project that may not be fruitful for years. Good is still hanging around! Oh well, pretty cool anyway! Can't say it any better. The only question here is whether the treatment will cure the cancer. Or just make the patient sick with another disease. SCHWARZENEGGER: I know, but that's why I said, you know, you've got to go beyond just the principles. You've got to go and say, "What is right for the country right now?" I mean, I see that as kind of like, you go to a doctor, the doctor's office, and say, "Look, can you examine me?" The doctor says, "You have cancer." What you want to do at that point is you want to see this team of doctors around you, have their act together, be very clear, and say, "This is what we need to do," rather than see a bunch of doctors fighting in front of you and arguing about the treatment. I mean, that is the worse thing. It creates insecurity in the patient. The same is with the people in America. That creates insecurity when you have those two parties always arguing and attacking each other, rather than coming together and saying to the American people, "Here's the recipe. This is going to be tough, but this is what we need to do for the next two years. And we both believe in that." That will bring calmness to the market and stability to the market. I'm an ardent Keynesian in this situation. I think the government has to do what the private sector is not willing or capable to do. If the figures are right, there is going to be a $3 trillion shortfall in aggregate demand. This $787 billion seems like a drop in the bucket. And how much farther ahead of this thing might we be if we hadn't spent nearly (or is it over?) $1 trillion on a war that served no purpose (at least from an economic perspective)? What is astonishing is that the government spent so much over the past 6-7 years on the war...how much worse would the economy be right now if it hadn't? NOBODY talks about that. It is my firm belief that we never really got out of the recession in 2001. So, in a sense, this is the longest recession in history. Some might say "depression." Take away that government "stimulus" and what do you have? Or, maybe the answer is that like a lot of things over the past 8 years, the government didn't provide any oversight into how the money was spent. 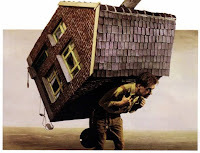 As the Mortgage Meltdown spills over into the Credit Crunch and recession, most of us who own homes (or at least live in homes where we pay a mortgage) have seen the value of our home decline precipitously. Where prices rose the highest and the fastest, they've come down the farthest and the fastest. In some areas, real estate values have dropped by over 50 percent. Side note: If you can get a loan, start thinking now about buying a home if you don't already own one. Prices may drop further, but not by much -- if, that is, the economy doesn't go into free fall. If it does, all bets are off. In trying to cope with falling values, I suggest you look at your house purchase as a two-part purchase, the first being the intrinsic value of the utility a home provides (shelter), the second being the investment value. I submit to you that in years past (prior to the run-up in house prices), the investment value of your real estate purchase was trivial, whereas the past few years it held the majority component of your purchase. Let's use an example. The discussion below assumes you paid cash, for simplicity. Nobody does this anymore, so the leverage is much higher, and your return on investment is considerably higher than this cash method suggests. Keep that in mind. Say you bought your house in 1990 for $100,000. Back then, in a "normal market" you could expect the value of your house to rise by 2-5 percent (depending on where you lived). I'd estimate, then, that 95% or so of your mortgage was the intrinsic value of the shelter you purchased, and 5% was the investment component. So, if your $5,000 "investment" rose in value to $105,000, you made 100% on your investment. Not bad. In fact, excellent! But how much did your "shelter" component rise? Let's say rents rose by 2% in a year. In a market where rents and mortgages were in line (we'll call it equilibrium), the value of your shelter, by definition, rose 2%. That is to say, if you could rent out your house, you could rent it out for 2% more this year than last. So, in fact, the gain on your $105,000 house was $3,000 investment and $2,000 intrinsic value. Still, a 60% gain on your "investment." Not bad at all. Your $100,000 house is now $500,000. If you bought it in 2005, I'd estimate that your investment component was around $390,000! In other words, at 2% per year growth in rents, your shelter component is only worth about $110,000! That leaves a lot of room for investment losses!!! In fact, if house prices fall by 50%, it is my contention that your shelter component barely moves. If anything, it has risen, simply because rents should be increasing as everyone moves out of "too expensive" homes to apartments -- the demand for rentals has risen dramatically through this mortgage debacle. So, if your house declined in value by 50%, down to $250,000, I am suggesting that all of it was comprised of the investment component. But, the intrinsic value of your house has risen. I know, money is money. And you've lost a lot. But if you felt that your house was worth $500,000 in 2005, what makes you value it any less today? Your loss is only on paper. If you truly believed that your home was worth the half a million dollars you paid for it, then it truly has gone up in value since then. Of course, you cannot realize that gain right now. Or for quite some time for that matter. Think of your house for a moment as you would the purchase of a stock. There's the future cash flow (dividends) and the capital appreciation. If the stock does not rise in price, but keeps paying out the same dividends, it's still worth what it was when you bought it. It may be worth more to somebody else right now, or it may be worth less (this is all based on price). But to you, it is worth just the same. If the price falls on the stock, yet the dividend remains the same, then isn't the stock intrinsically worth more? That's what I'm saying about your home. On paper, you may be suffering a "wealth effect." But in real life, your home is providing the same utility today as it did when you bought it. In fact, it may be providing more. Rents have not fallen, they've only gone up in the real estate "collapse." Therefore, the shelter component of your purchase is worth more today than yesterday. It is only the investment portion of your purchase that has taken a beating. Try to set that aside for a while. In time, you will recoup your investment, and then some. Especially with the rapid inflation the Fed is building into the system. Don't be surprised, if in 5-10 years, your investment will be reaping positive returns! President Obama and his team are in the midst of designing a plan to reduce mortgage foreclosures. A big part of the plan is to give some relief to existing homeowners (or, more appropriately, people who live in houses that were purchased through borrowed money called mortgages. Not many people really own their homes) by making loan modifications for "responsible homeowners." As your neighbor loses his house, and the value of that house declines because the bank that now owns the house doesn't want it and sells it low just to get out from under it, what do you think is happening to the value of YOUR house? As almost everything goes in economics, Adam Smith's "Invisible Hand" is at work! People do the things they do for self interest. So give this one a try: If your neighbor can somehow keep his house, it won't decline in real value (it may decline in perceived value), but until it hits the market, "comparable sales" will not show a decline in your neighborhood, and that's GOOD FOR YOU!!! The story below takes the reader on seriously scary ride. It's about the economy and how it nearly collapsed. I am not so sure that we'd be living in Escape from New York or Terminator land, but estimates of $5.5 TRILLION being pulled out of a $11 Trillion economy scare the snot out of me. Welcome to the February 9, 2009 edition of Kids and Money. Matthew Paulson presents Throw a Great Kids Party on a Budget posted at American Consumer News. Savings Toolbox presents Reducing What You Waste Will Save Some Cash posted at Savings Toolbox. Livingalmostlarge presents Stay at home - loss of potential income posted at LivingAlmostLarge. Mark Montgomery presents Best Value Colleges from Princeton Review: Information You Can LoseGreat College Advice, saying, "Choosing a college based on rankings--even on which colleges are rated a "good value"--is not a recipe for educational success." Kevin Fleming presents Dish Network Family Package Review posted at Satellite TV Guru, saying, "If your family is thinking to switching to Satellite TV to save money, we have recently updated our Dish Network Family Package review for 2009." Silicon Valley Blogger presents Family Life In America: Report on Lifestyle, Economic Trends From The Trenches posted at The Digerati Life, saying, "Happy New Year!" The Smarter Wallet presents Family Budget For Frugal Living: Living Cheap Can Be Fun, Too! posted at The Smarter Wallet, saying, "I submitted this to the previous carnival but it wasn't published so I will try again! I will do my best to spread the word about this carnival. Thanks! -SVB"
Russ Egan presents How to Take Control of Your Finances posted at Open Road Open Mind. Joe Manausa presents January 2009 Housing Market Trends | Tallahassee Real Estate Blog posted at Tallahassee Real Estate Blog, saying, "The continuation of the three-year-old bear market in real estate has brought many people forward to comment on the condition of the real estate market. It seems for everybody with an opinion, there are an equal number of theories about where the housing market is going. So, not to be left out of the crowd……. I thought I would chime in with an (updated) opinion of my own." David presents Decision Making 101: Step One The Way We Make Decisions posted at Personal Finance Ology, saying, "Making smart decisions is the first step in building long term wealth. Learn the methodology behind making wise decisions with your money." Concerning Kids presents The Top Child Vitamins Available Today - A Helpful List posted at Concerning Kids. KCLau presents Best of KCLau’s Money Tips 2008 posted at KCLau's Money Tips, saying, "A run down of the best KCLau’s Money Tips 2008"
Barry presents Keeping A Change Jar At Home posted at Associate Money. Matthew Paulson presents Teach Values While Shopping for Your Kids Clothes posted at American Consumer News. Concerning Kids presents Healthy After School Snacks For Kids posted at Concerning Kids. KCLau presents Procrastinator, plucker, plotter, and prober posted at KCLau's Money Tips, saying, "Recently I was reading the book titled “The Number: What do you need for the rest of your life and what will it cost?” A rundown on what the book has to offer"
Finance Tips 101 presents Identity Theft Prevention Tips posted at Finance Tips 101. Dave presents Extra Income Ideas I posted at Cheapo Groovo. FMF presents Financial Steps New Parents Need to Take posted at Free Money Finance, saying, "Tips for new parents." More than just a mother presents The hidden cost of children posted at More than just a mother. Pinyo Bhulipongsanon presents Teach Your Children The Four Pillars of Money Management posted at Moolanomy. Jim presents » Five Personal Finance Teaching Gifts for Kids on Blueprint for Financial Prosperity posted at Blueprint for Financial Prosperity. Praveen presents "That Will Be 50 Dollars!" posted at My Simple Trading System, saying, "My 3 year old son seems to understand money, but overcharges. $50 for a pretend Happy Meal or taxi ride..."
Silicon Valley Blogger presents YNAB (You Need A Budget) Personal Budget Software Is 10% Off, saying, "Here's a great budgeting tool to manage your family budget! YNAB is actually rated higher than Quicken, as a desktop personal financial software application." The Smarter Wallet presents Cheap Meals You Can Cook At Home To Save Money! posted at The Smarter Wallet, saying, "Family meals that you cook at home can save you money, and they can be tasty too!" Jacquelyn presents Simple Ways to Teach Your Child the Value of Money posted at WParent.com - Wise Parenting Guide, saying, "Teaching your children the value of money is the parent's responsibilities through parental guidance and example." Big Cajun Man presents Banks and Humor posted at Canadian Personal Finance Blog, saying, "The video alone is great for kids as it shows how banks used to work before ATMs and open 12 hours a day banks." Joe Manausa presents Real Estate Sales Success | Tallahassee Real Estate Blog posted at Tallahassee Real Estate Blog, saying, "By tracking movement of inventory in the MLS, one is able to tell if the market is expanding or contracting, and whether property values are rising or falling. With this information in hand each month, you can best understand a great strategy for selling a home (or one for buying a home)." Aussie Investor presents Ethical Managed Funds posted at Australian Investing, saying, "Managed funds are a popular way to gain investment exposure to many asset classes including the stock market. But with growing concern over global warming and other environmental and social issues, many investors are turning to ethical fund managers to manage their money. So what are ethical managed funds are why would you invest?" Finance Tips 101 presents Credit Card Debt It Is Not Always Your Fault posted at Finance Tips 101. Concerning Kids presents Tips To Get Your Baby To Sleep Through The Night posted at Concerning Kids. David presents The Way Money Works posted at Personal Finance Ology, saying, "Make your money work harder, so you don't have to. Learn basic principles that teach you how to make money work for you." 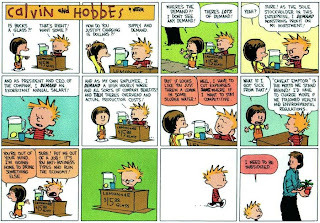 Here's a great comic strip, Calvin and Hobbes. Click on the image to enlarge it. 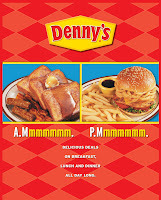 Remember the Grand Slam from Denny's? It was $2.99 for scrambled eggs, bacon, and pancakes. Well, Denny's has one-upped themselves. Today, until 2PM, Grand Slams are FREE! This one comes from one of my favorite writers, Thursday Bram. Plus, her name is pretty cool!